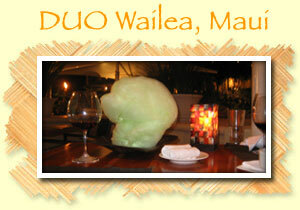 DUO is one of our favorite restaurants on the island. As you can see from the photos, each time we go, we always forget to take pictures until it's too late. Once the food it there, we dive in! So, the photos you see are of the dessert. They offer a fantastic Chocolate Soufflé with vanilla ice cream and every table is brought fresh cotton candy to cleanse the palette. The restaurant offers fine dining for dinner only. They're located on the pool level at the Four Seasons Resort in Wailea, South Maui, just below Spago. We're convinced that you can't get a better steak on Maui. They offer all kinds of cuts, including Kobe Beef filets by the ounce. With your steak, they will bring you your choice of sauces, of which they have many to compliment your meal. All entrees are ordered separately from the sides. Duo isn't cheap, but you wouldn't want it to be. 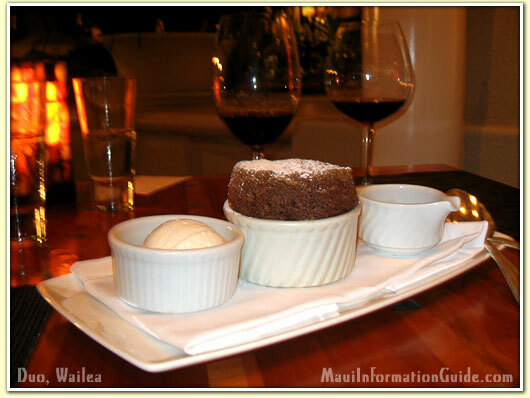 They offer a truly divine dining experience, one that is unparalleled on Maui. Reviews, photos, and video of the resorts on Maui.